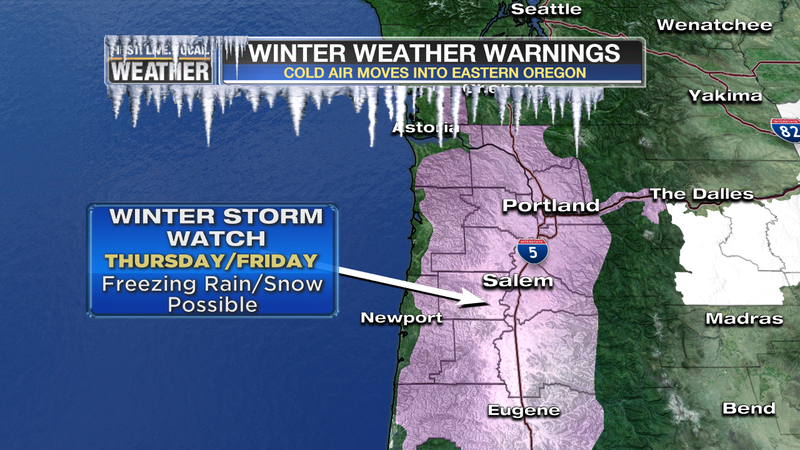 The NWS has issued a Winter Storm Watch for much of Western Oregon between the Coast/Cascade Ranges for Thursday and Friday. 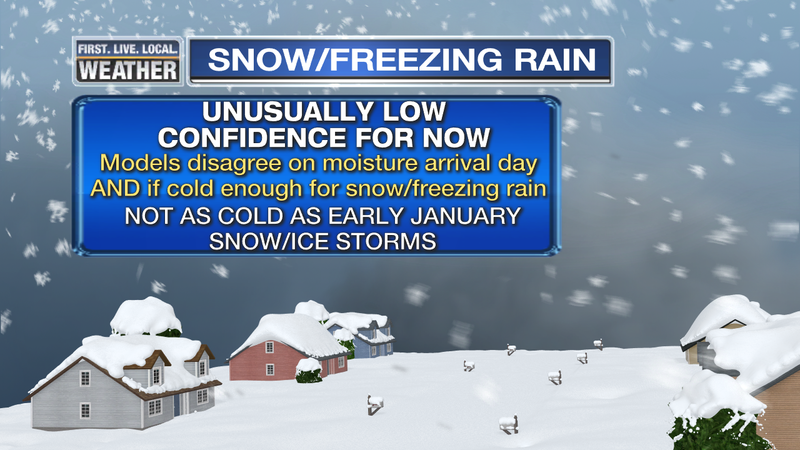 That means snow and/or freezing rain is POSSIBLE during this period but some of us may not get it, or get much of it. Wednesday should be a dry day, or mainly dry. Possibly a flurry/sprinkle in the afternoon that WILL NOT AFFECT ROADS. Thursday AM should be dry as well for a clear AM commute. At some point Thursday afternoon or evening, snow will spread north across Western Oregon and up into SW Washington. Timing is TBD since we’re still 2 days away. First guess (still 2 days away!) 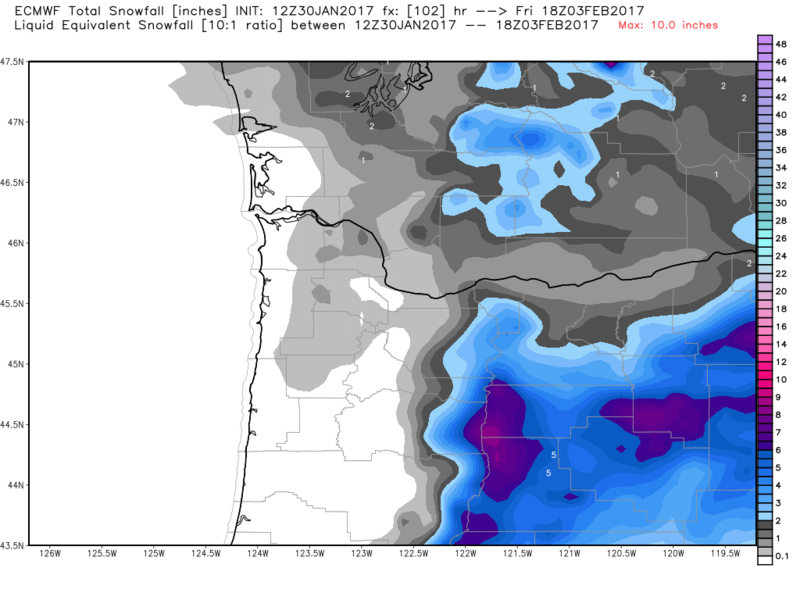 is 1-2″ snow for many of us in the western valleys before a transition to freezing rain by Friday AM. If the transition takes longer? More snow, less freezing rain. During the day Friday, freezing rain is likely at times, but it’ll become confined to near the Columbia River Gorge (central/east Portland metro area) as temperatures rise above freezing in most other locations. It’s possible that Friday afternoon many of us will see mainly wet roads south/west/north metro away from the Gorge. This happened during the last two freezing rain events when we thought a large area would see freezing rain and instead it was confined to the central/east metro area. A warming southerly wind late Friday night or early Saturday ends the freezing rain threat outside of the Gorge at that time. 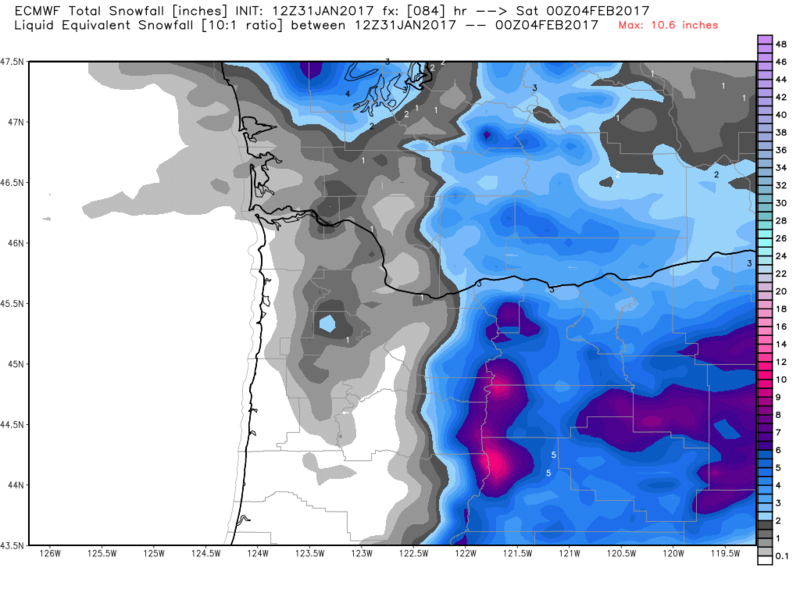 None show more than 2″ anywhere in the western valleys. That’s due to warmer air coming in overhead…not “warm”, but warmer. Then the next question has been “how cold will the air mass be that moves in on the east wind?” I see several hints that it won’t be as cold as previous events in January. The result could be that it’ll be easier to get temps above freezing over a larger area west of the Cascades during the daytime Friday, even with the easterly flow continuing through the Gorge. I know we are all focused on snow and freezing rain, but I need to mention the strong wind tomorrow too. Check out the cross-section from the WRF-GFS for the next 3 days. The solid wind barbs represent 50kts and each little barb is 10 kts. So from tomorrow morning through Thursday evening easterly wind is forecast to exceed 60 mph over our heads…up around 2,000′. Some of this strong wind will surface as gusts around 40-50 mph. Of course this means we’ll see a few limbs/trees come down, especially across the east side of the metro area. 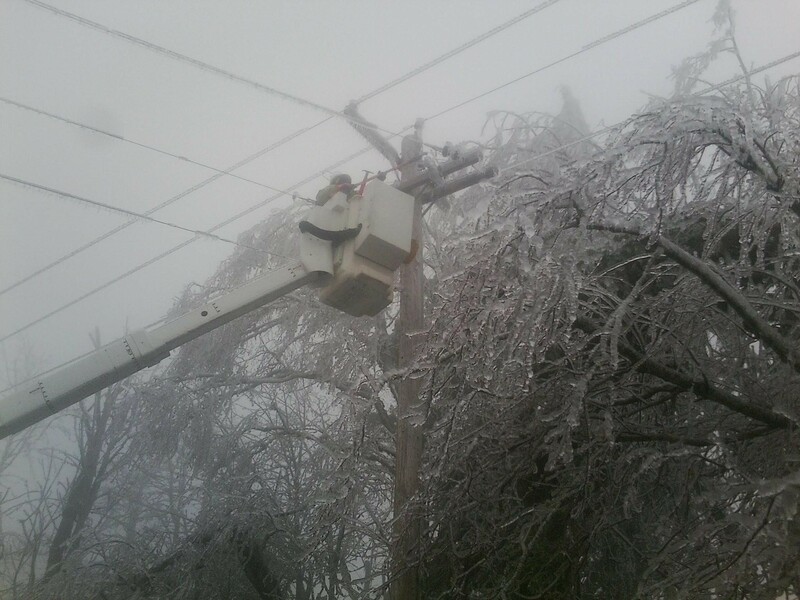 Since we’ve already seen wind this strong this winter I doubt we’ll see widespread power outages. But regardless, it’s going to be a gray and chilly afternoon Wednesday. It’ll be a big reminder that winter isn’t finished yet! It’s been a very gloomy day out there with low clouds hanging over most of the metro area. The good news is Tuesday will be a much brighter day; I expect clouds to break up to partly to mostly sunny skies in the wake of a cold front passing through the region. The air coming in tomorrow is cooler and drier, thus the increasing sunshine. Temperatures remain at/below freezing Wednesday-Friday in the Gorge. At some point we’re going to see sticking snow and/or freezing rain in at least portions of the metro area during this period. 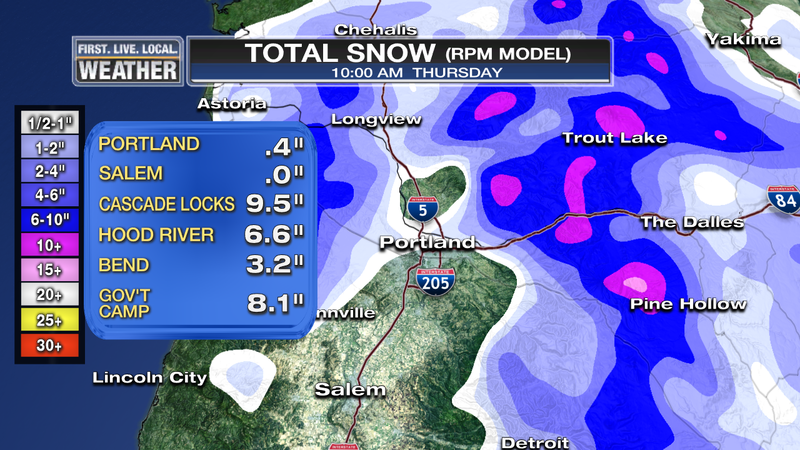 The Gorge turns snowy/icy again with a little snow late tonight/Tuesday AM, then quite a bit likely Thursday/Friday. Will we actually see snow sticking in the metro area Wednesday? Possibly, but as of now most models are mainly dry for that day. This could change. 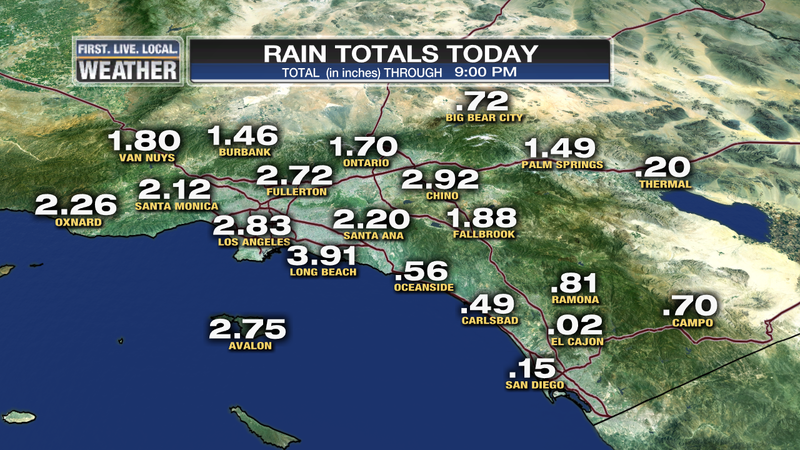 (10pm update) All models except our RPM are pretty much dry Wednesday. I’ve taken the chance of anything other than flurries out of the Wednesday/Wednesday night forecast. How much moisture Thursday/Friday? Some models are mainly dry through at least midday Thursday and then light freezing rain Thursday night/Friday AM. Others have more widespread snow Thursday before a changeover. I’m sticking with a later arrival (sometime Thursday) for now. (10pm update) Definitely a later Thursday & Friday event showing up now. Thursday might even be dry to start. The cold air mass over us Wednesday-Friday isn’t nearly as cold as what we saw in the first half of January. That means it’s possible even IF we get a bunch of precipitation Thursday/Friday, some areas could be above freezing west of the Cascades = less frozen precip. Another reason the forecast is very tricky. While the 18z GFS has a dusting to an inch or so. The 12z WRF-GFS is slightly snowier. The big message here is that as of this moment no models are showing a huge snowstorm or major ice storm in the western valleys. But we all remember the January 10th snowstorm though when all that moisture appeared out of nowhere! A good reason to keep an eye on trends in modeling and satellite imagery of course. As of tonight, the 33.2 degree average temperature makes January 2017 the coldest month in Portland since December 1985! That was halfway through my junior year in high school…a long time ago in a county far, far (80 miles) away. That month we had high pressure centered over the Pacific Northwest much of the month with snow-covered terrain east of the Cascades the whole time. 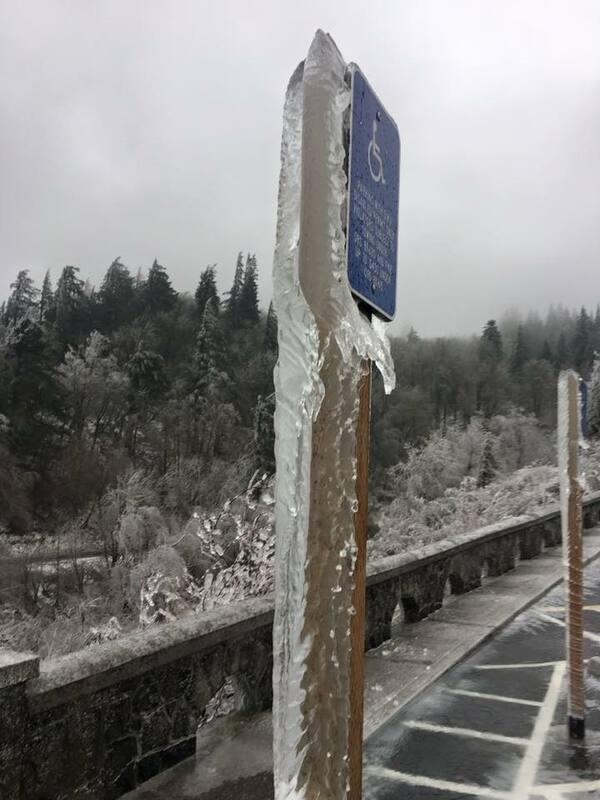 Cold east wind blew much of the month through the Gorge…sound familiar? This will also be the 7th or 8th coldest month on record at PDX. Those airport weather records go back to 1939. It appears we have one more brush with cold/snow/ice this week as February arrives. Once again the Alaska upper-level ridge is trying to rise again. It did that in early/mid December and early/mid January. That shoves cold air to its east (over Western Canada) to the south toward and into the Pacific Northwest. There will be a “conflict zone” in the Pacific Northwest where the colder air from the north moves down under milder/moist air above. That “zone” seems to want to hang out somewhere near the Oregon/Washington border Wednesday through Friday according to most models. I’m VERY confident we have a chilly east wind back in the Gorge and east metro Wednesday-Friday. I’m FAR LESS confident about the depth & intensity of the cold air and how much moisture rides over it Wednesday-Friday. For that reason I have very few details for now. As of this moment I think we’re “safe” from any travel issues west of the Cascades (due to snow/ice) through Wednesday afternoon at least. 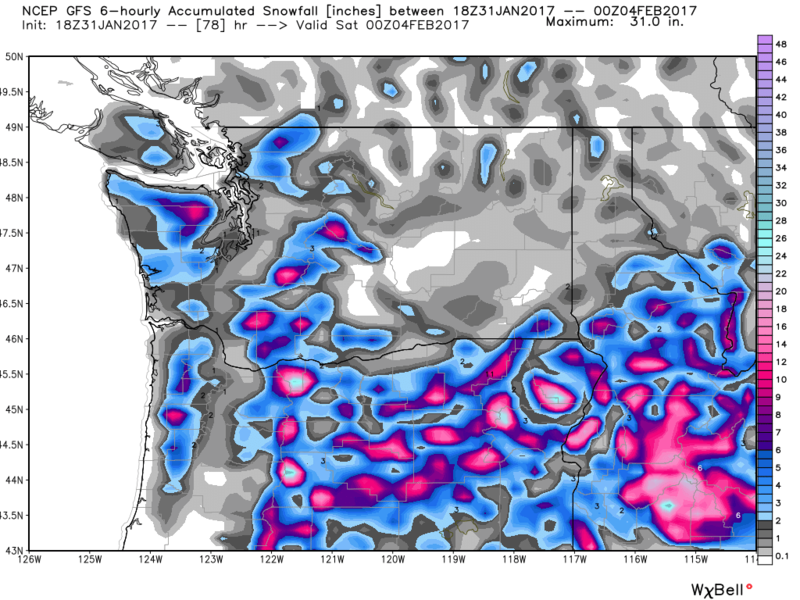 Most models have very little moisture available for snow or freezing rain west of the Cascades until at least sometime Thursday or Thursday evening. There is no need to cancel plans or have any sort of “grocery-store freak out” tomorrow or Tuesday. 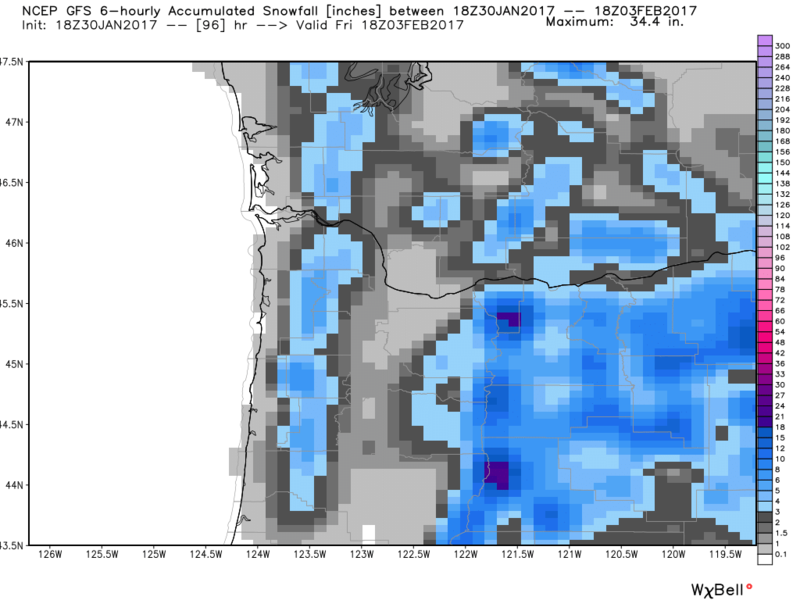 If you live in the Gorge (especially central/east) it’s very likely another snow/ice episode is coming at some point Wednesday night-Saturday. Temps near/below freezing during that time. Maybe most important, as of now I don’t see a similar setup for a road fiasco like early January. By that I mean the failure of local transportation agencies to clear roads of solid snow/ice well after the event. This isn’t a “snow, then hard freeze for a bunch of days” setup like the first half of January. Even if we get snow/ice it will go away within a short time (hours to a day or two). The weather is quite slow again today with areas of morning fog/clouds leading to at least partly cloudy conditions this afternoon. A little more easterly flow Friday through Sunday SHOULD give us more sunshine. We’ll see how that works. The next chance for a real soaking isn’t going to be until February! That would be next Wednesday of course. 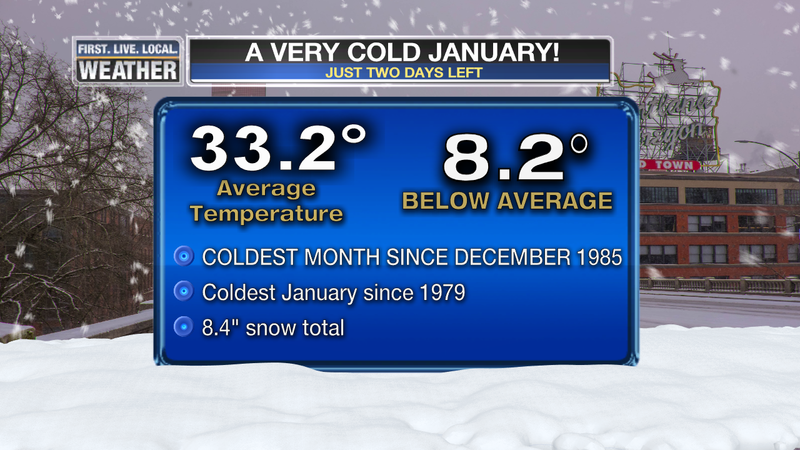 As of Wednesday, January is the 5th coldest month on record here in Portland. We still have 6 relatively mild days to go, but we could easily end up with the coldest month since 1990 here in Portland and one of the top 10 coldest months! On another note, today is the anniversary of the last great Cascadia Subduction Zone earthquake. It was in the evening, January 26th, 1700. Geologists tell us it was likely at least a 9.0 magnitude quake just offshore. Some have theorized the massive Bonneville Landslide and the resulting “Bridge of the Gods” in the central Columbia River Gorge could have been triggered/formed by the big quake, but it appears maybe it is too old for that to be the case. Great reading again just on the Wikipedia link. It is REAL quiet in the weather world this evening. After tons of weather fun/craziness to talk about more or less since the first week of December, things are much calmer now. I don’t see any stormy weather, flooding, cold spell, or high winds in the next week. It appears January is going to go out with a whimper compared to the first two weeks. The snow and ice are ever so slowly melting in the Gorge. I see for the first time in 2017 The Dalles has made it to 40 degrees today! That’s a good 21 degrees warmer than last Sunday’s high of 20. Wow, that was a cold 6 day stretch below 24 degrees for you folks. Here in Portland we were in the mid 40s near the Columbia River, but up around 50 in areas removed from that cool easterly wind drift. 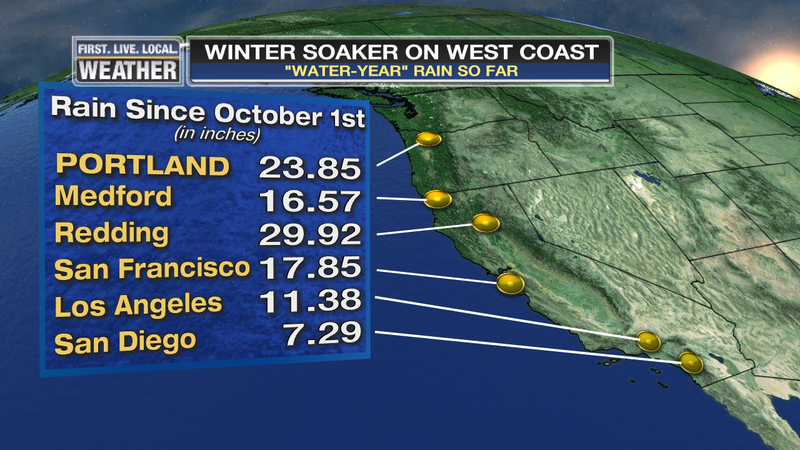 EVERYONE is getting in on the precipitation this year, which has pretty much erased drought along the West Coast. 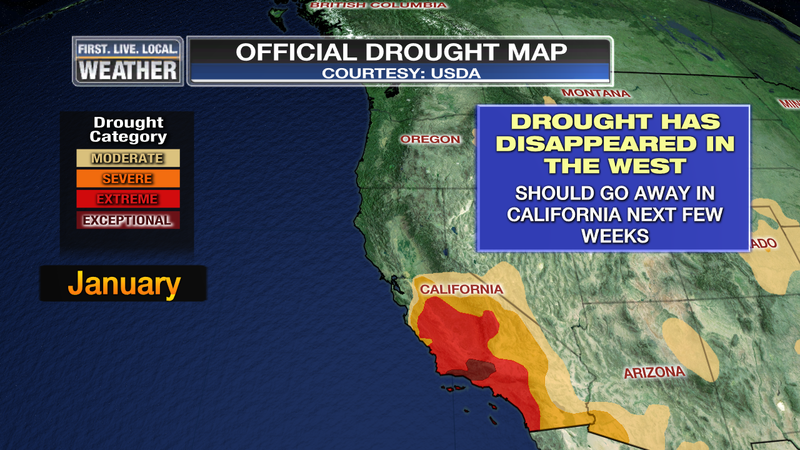 It seems like the Drought Monitor graphic usually runs behind a few weeks, so we’ll see if that southern part of California improves. The big storm that soaked California today may give the southern half of Oregon a few scattered showers again Monday, but for those of us north of Salem/Bend, Monday is looking mainly or all dry. We’ll go partly cloudy in the afternoon. Tuesday looks similar and then a very weak weather system runs into a developing ridge of high pressure late Wednesday and that MIGHT give us a shower late in the day or Wednesday night. Colder easterly wind develops later Thursday through Saturday as we go into a typical wintertime inversion pattern. That’s warming in the mountains and chilly valleys. Enjoy the break from the weather this week! Warm South Wind Has Arrived! 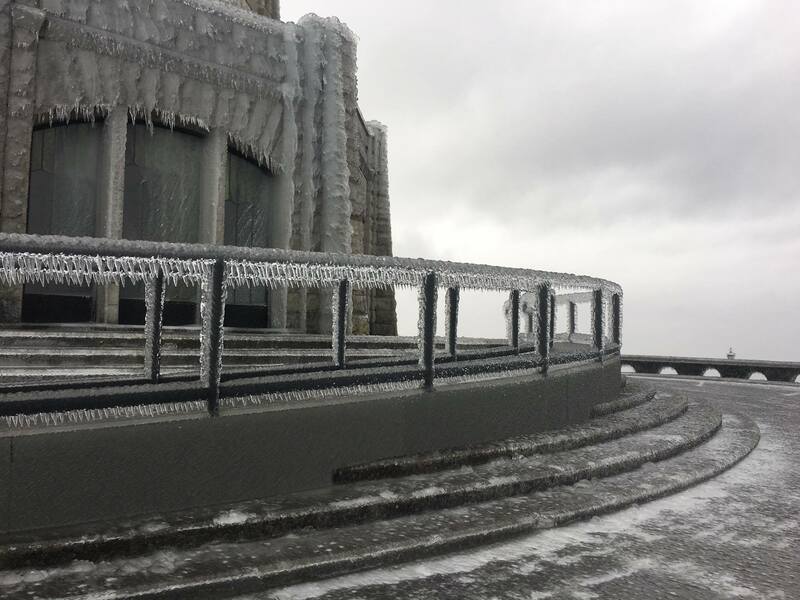 Portland suddenly jumped to 46 degrees this hour as a warming “Chinook” wind arrived. The same thing happened in Troutdale and Corbett as a cold front passed by. That front mixed out the cold air lingering at the far west end of the Gorge. 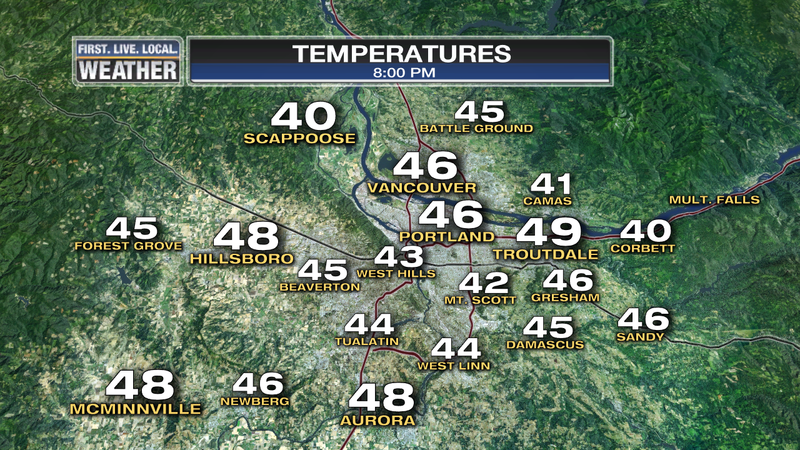 In fact Troutdale is the warmest location in the ENTIRE metro area this hour! By the way, the term “Chinook wind” was first used along the Pacific Coast, then the term was adapted to use in the Rockies and Great Plains to describe the warming west wind there in wintertime. It refers to a sudden warming after a cold spell in winter. That pretty much describes this evening. But a south wind won’t make it far into the west-east oriented Columbia River Gorge. 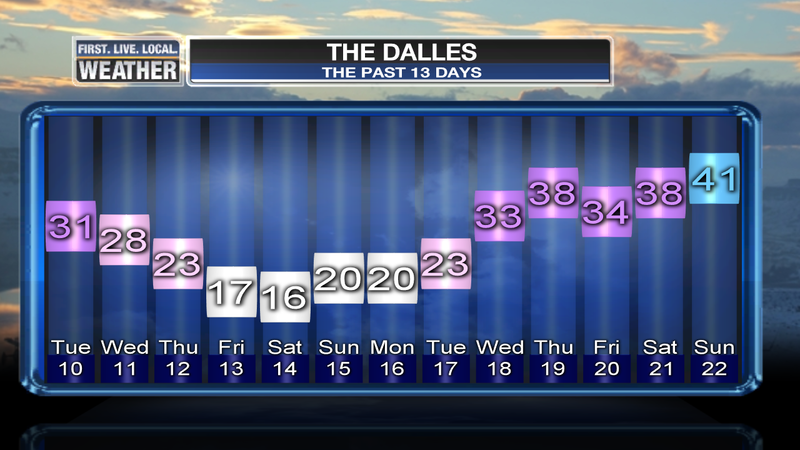 Temperatures will only slowly moderate 3-5 degrees above freezing from Bonneville to The Dalles Thursday. The cooler east wind does return on Friday and I don’t see a setup in the next 5 days that would push a warm wind all the way through the Gorge. 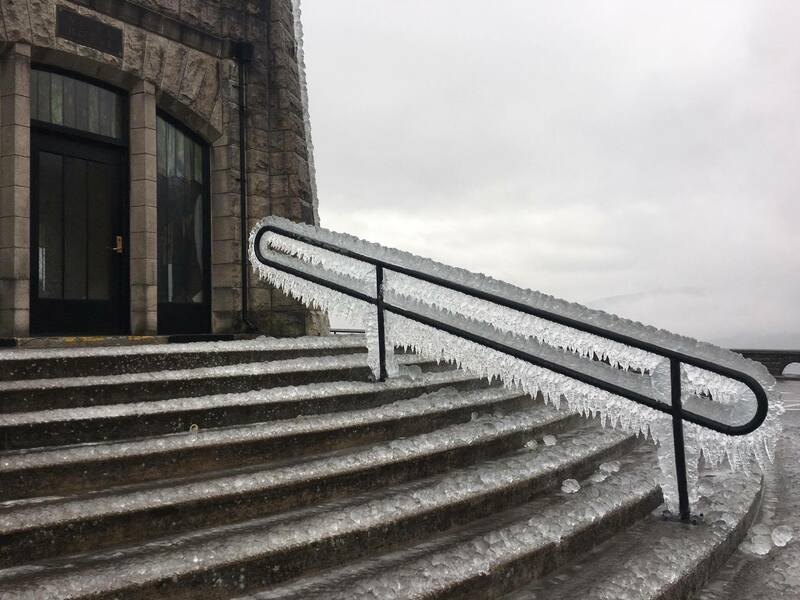 The NWS has dropped the Ice Storm Warning in the Gorge this evening due to precipitation tapering off quickly now that the cold front has moved by. I’m so glad we ended up slightly too warm in the east metro area or we could have seen something similar in Gresham, Fairview, & East Portland. Tomorrow’s weather will be uneventful with scattered showers and maybe even a few sunbreaks. Enjoy the slowdown. At least the forecast ice thickness panned out, but just in a much smaller part of the metro area. Check out how thick the ice is! 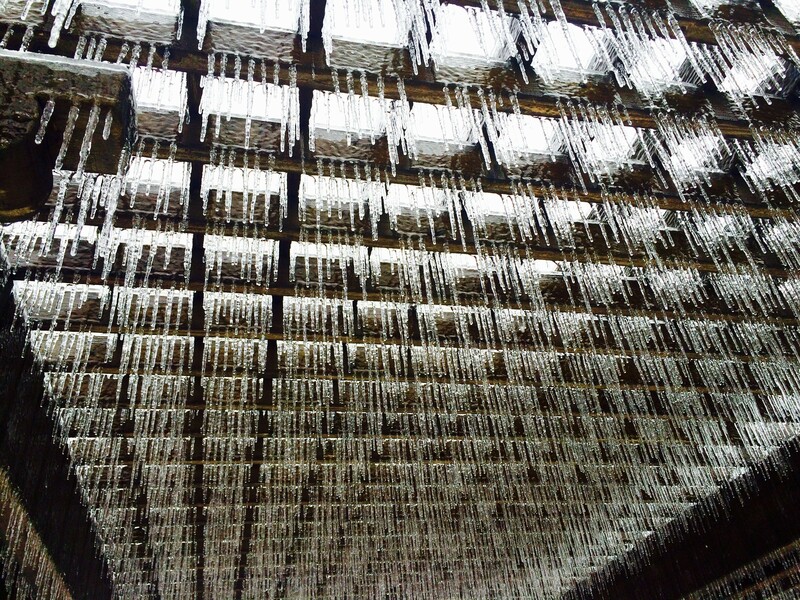 …An inch of freezing rain in just about 8 hours in Troutdale. There could easily be 1/2″ additional before temps rise much more by sunrise. Farther into the Gorge the ice storm continues through Wednesday, likely going slightly above freezing at the west end though. You are currently browsing the FOX 12 Weather Blog blog archives for January, 2017.